Important! This is an unofficial non-profit fan club page. 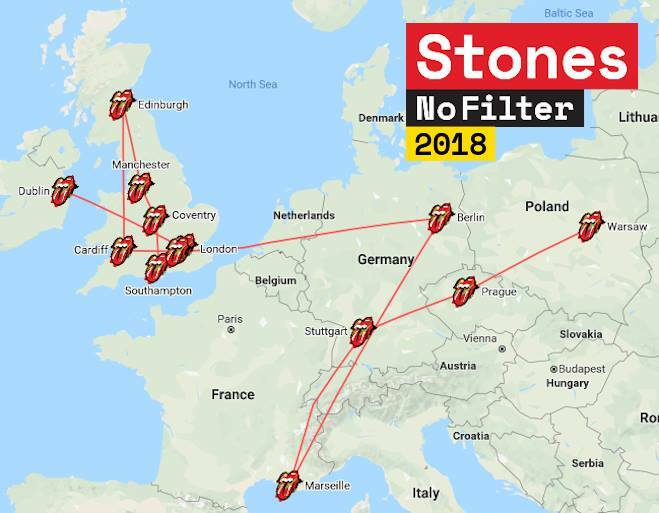 Please read all the information on this page before you start planning your travel into Stonesland! If you have information, corrections, additions or comments, please send email. For official concert and ticket information see RollingStones.com Tickets. Thanks! All crowd numbers have been updated to officially sold tickets as per 02-Aug-2018. For ticket sales and details see RollingStones.com/tickets. PENDING LICENCE means the show is confirmed, but the venue is still subject to approval, made by the city council during March 2018. Updates: Feb 11: Dublin, Manchester, London rumoured shows added. Feb 13: Southampton rumoured show added. Feb 14: Edinburgh rumoured show added. Feb 16: Manchester rumoured show(s) added. Feb 16: Marseille France rumoured show added. Feb 21: Berlin Germany rumoured show added. Feb 21: Berlin Germany rumoured date changed. Feb 21: Twickenham rumoured date June 23 removed. Feb 21: London shows rumoured for May added. Feb 21: Warsaw and Prague rumoured shows added. Feb 22: Stuttgart Germany rumoured show added. Feb 22: Birmingham England UK rumoured show added. Feb 22: Berlin show location is rumoured to be Olympiastadion. Feb 22: Stuttgart show update to Mercedes Benz Arena Sat June 30. Feb 25: Edinburgh date rumoured for Sat Jun 9. Feb 26: Cardiff rumoured show added. 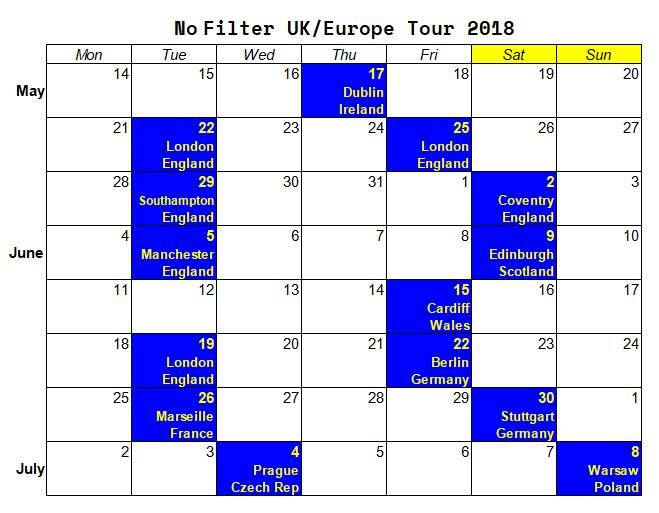 Feb 26: No Filter UK/Europe Tour 2018 officially announced at 9am CET with the following 11 shows announced initially: Dublin May 17, London May 22, Manchester June 5, Edinburg June 9, Cardiff June 15, London june 19, Berlin June 22, Marseille June 26, Stuttgart June 30, Prague July 4, Warsaw july 8. Mar 01: London Stadium show May 25 confirmed. Mar 09: Southampton and Coventry rumoured dates added, probably confirmed within a week. Mar 12: Southampton and Coventry dates confirmed. Mar 20: Dublin venue licence granted today, show confirmed finally. Please send any info you might have! If you have information, corrections, additions or comments, please send email. Thanks! It's Only Rock'n Roll: See a sample of the magazine - IORR 61 - the best Rolling Stones reports, pictures and updates. Click on the images to get a separate map/table loaded into your browser!